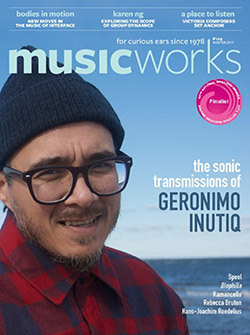 Canada's premiere creative and new music magazine in their 129th issue, Winter 2017/18, with Geronimo Inutiq on the cover, plus articles on University of Victoria's music department, reedist Karen Ng, Hans-Joachim Roedelius, Kamancello, Quasar saxophone quartet, Biophilia, Spool, and an 11-track CD with music from those artists and more. 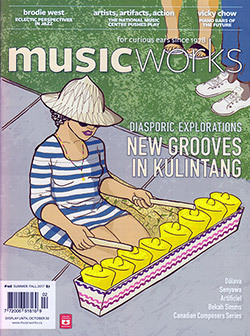 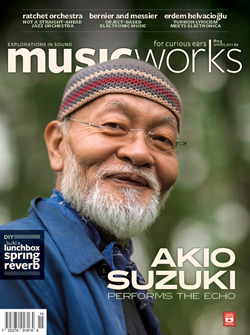 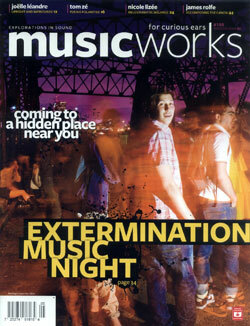 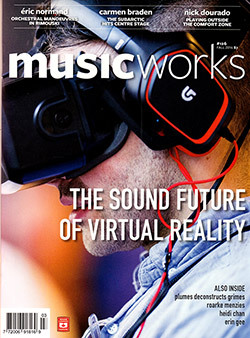 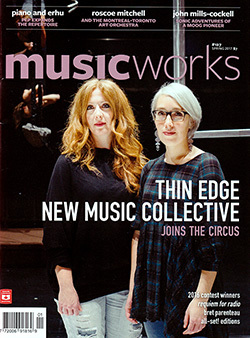 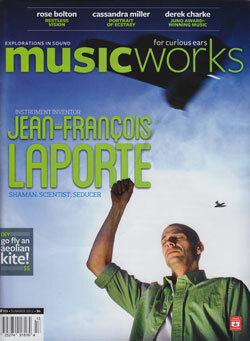 Summer 2017 issue of Canada's premiere new music magazine, with a CD featuring tracks from selected artists covered in the magazine; Bekah Simms; Senyawa; Pantayo, HanHan, and Luyos MC; Brodie West; Artificiel; Another Timbre's Canadian Composers Series; Vicky Chow; Festival de International Musique Actuelle de Victoriaville, 33rd Edition reviewed; &c. &c.
Canada's premiere music magazine, with articles on The Sound Future of Virtual Reality; Roarke Menzies; Heidi Chan; Erin Gee; Eric Normand; Carmen Braden; Nick Dourado; plus a CD with recordings from Eric Normand, Carmen Braden, Erin Gee, Nick Dourado, Heidi Chan, and Plumes Ensemble. 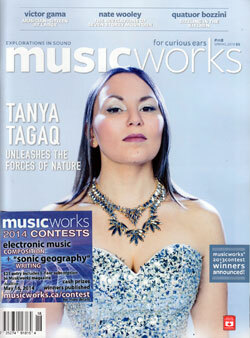 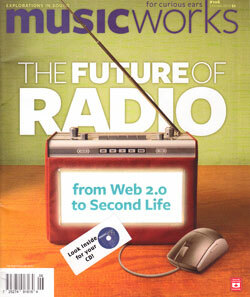 Canada's premier new music magazine in their 125th issue, articles include Ayo Leilani; Ocean Bug and Bird Songs; Gabriel Dharmoo; crys cole; Thin Edge New Music Collective; plus a CD with tracks from Witch Prophet; Gabriel Dharmoo; Tim Brady; crys cole; Marc Saba; &c. &c.
Features: The Expanding Universe of Yamantaka // Sonic Titan; Yamantaka // Sonic Titan; The Retro Aesthetic of Le Revelateur; JOYFULTALK (Drip Audio); Muuixx; Hard Rubber Orchestra; Festival International de Musique Actuelle de Victoriaville; Allison Cameron and Contact; plus live and recorded reviews. 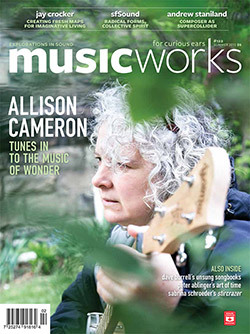 On the cover, Allison Camerson. 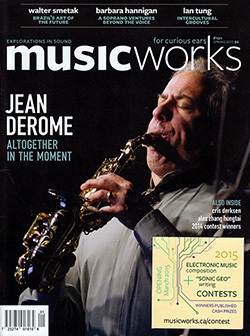 Inside: Dave Burrell's Unsung Songbook; Peter Ablinger's Art of Time; Sabrina Schroeder's Stircrazer; plus reviews of recordings and events, label profiles, essays, &c. &c.
On the cover, Jean Derome. 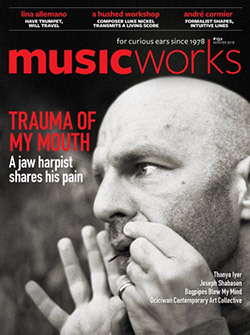 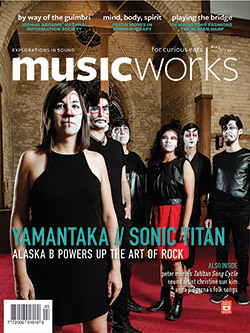 Inside: Walter Smetak; Barbara Hannigan; Ian Tung; Cris Derksen; Alex Zhang Hungtai; plus reviews of recordings and events, a label profile, essays, &c. &c.
Fall 2014 issue with a 12 track various artist CD from Canada's premiere new music magazine. 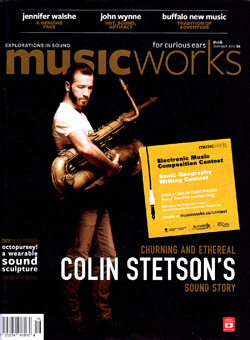 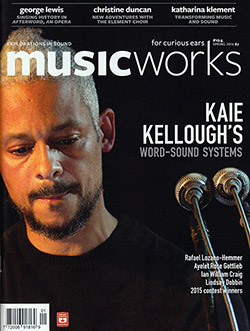 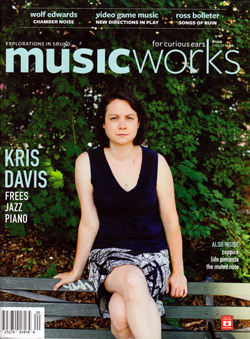 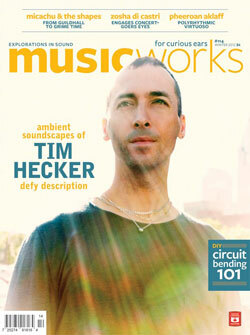 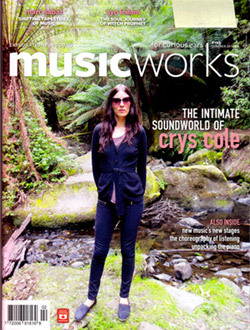 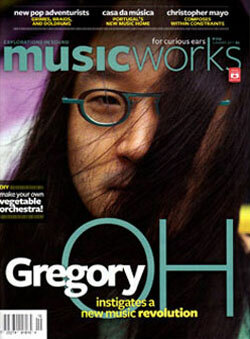 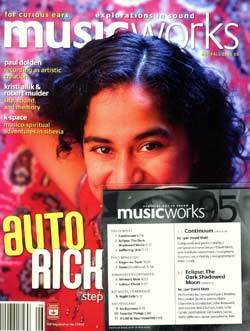 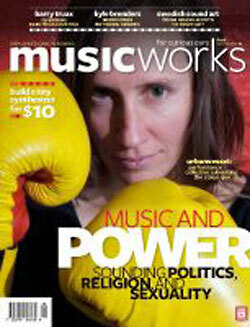 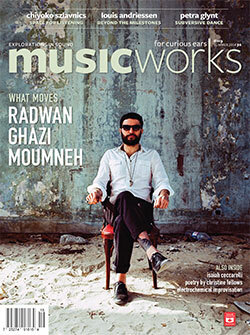 On the cover: Kris Davis; articles on Wolf Edwards; Video Game Music; Ross Bolleter; plus Coppice; Lido Pimienta; The Muted Noise; live and recorded reviews; &c. &c.
Spring 2014 issue of Canada's best new music magazine, with articles on Margaret Noble, Nate Wooley, Victor Gama, plus articles, reviews, and a 13 track CD with tracks including Noble, Wooley, Gama, &c.
On the cover: Giorgio Magnanensi; Articles on Charlemagne Palestine; Sarah Neufeld; The Beirut Scene; Instant Places' Elastic Planets; Features on The Ondes Martenot; plus reviews of live events, recordings, books, &c &c.
Summer 2011 issue of Canada's premiere music magazine and CD, with articles and tracks from Gregory Oh, Grimes, Doldrums, The Vegetable Orchestra, Terri Hron, Miguel Azguime, Rachel Wadham, &c.
Canada's best music magazine, accompanied by a CD, with articles on Kyle Brenders, Barry Truax, Swedish Sound Art, UrbanVessel, and how to build a synthesizer for $10. 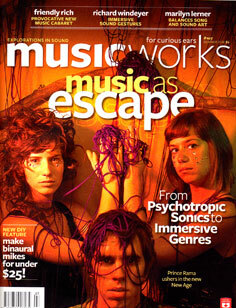 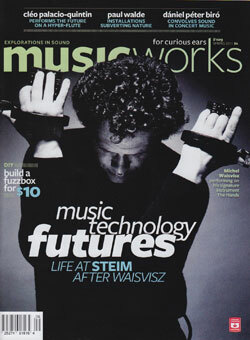 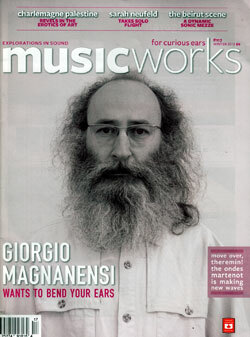 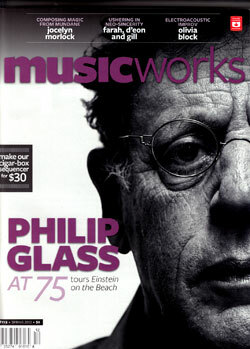 Canada's premiere new music magazine's Summer 2010 issue with articles on Marilyn Lerner, Richard Marsella, Richard Windeyer, Psychotropic Sonics, plus a 12-track CD. 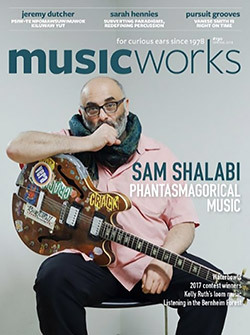 The great Canadian magazine of improv and compositional music, with articles on Yannis Kyriakides, Charles Stankievech, Anna Friz, loK8Tr, plus a 12 track CD including those artists. 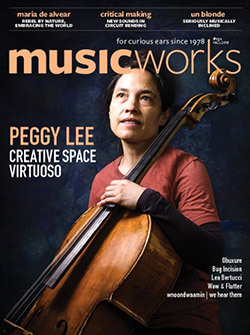 The great Canadian magazine of improv and compositional music, with articles on Joelle Leandre, Tom Ze, James Rolf, Nicole Lizee, plus a 15 track CD including those artists.